Distributed and licensed under the General Public License (GNU), WinLAME is an encoding supporting diverse audio formats. You will be able to set up the encoding process. Encoding and decoding: what distinguishes this software from others is that it supports numbers of audio formats. 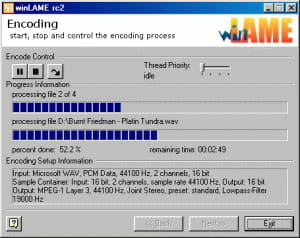 For example, for encoding and decoding, WinLAME supports mp3 file format via LAME for the encoding and MAD for the decoding. Batch processing: treating each file can be done in batch. For encoding or decoding, users are allowed to launch several processes at the same time. Even the application has to treat between different file formats. HTML Help file: packed with a detailed HTML Help File, users are given the opportunity to know more about the software. The tool is also integrated with an easy-to-use wizard-like user interface allowing easy handling. Other features: WinLAME is easy to install and uninstall and is lightweight; not occupying too much space on the HDD. The application also allows CD audio extraction (aka. CD ripping) including “freedb” support. WinLAME is easy to use. Supported file formats: AAC, Ogg, MP3, WAV and WMA. Latest update on January 4, 2013 at 02:20 AM.